I like to think of myself as a morning person, at least moreso than a daytime person. Sure, I dread waking up early to get ready for work, but I’d rather get up early for work than wake up later and starting later. I always found that mid shifts wasted your day. But if I’m being honest, my days are usually wasted anyways. It’s my choice & I know it’s not a good one. Anyways, when my alarm goes off at 5:40 a.m. I get up to snooze it and wait 10 more minutes for my 2nd alarm to go off. By the 2nd alarm, I’m not fully awake, but I’m on the way there. After wasting a few minutes staring at my phone, I start my morning routine wish a shower to wake up. This is where I’ll start wish washing my face. For the past few years, I’ve been using the St. Ives line of cleasing washes. Sometimes I interchange the facial washes, but I use the Blackhead Clearing Green Tea Scrub the most. Not only do I love drinking green tea, but it’s a great scrub on my face. It smells just like green tea, but it’s scent isn’t strong at all. The exfoliating beads aren’t as strong/prominent in this scrub compared to others so I don’t feel like my face is being scratched off. I don’t have many black heads so it must be working. Also, it’s supposed to calm redness, which I believe is working as well! After washing my face, I continue on with the typical shower stuff: Shampoo, conditioner, & body soap. However, to cut my morning routine short, I end my shower with In-Shower Body Lotion by Nivea. I believe there are 3 or 4 different in-shower lotions, but I’ve only tried the hydrating lotion with sea minerals. The scent of this lotion is my favorite. Anyways, what exactly is in-shower lotion? It’s lotion you put in the shower, duh! It helps keep you moisturized even after you rinse it off and dry off after your shower. I don’t have to worry about lotioning up again after I get out of the shower. My skin stays soft all day and I’m definitely glad I found out about this product! After showering and brushing my teeth, I continue my routine with moisturizing my face. My face gets dry really easily so I make sure to moisturize every morning with Ponds Dry Skin Cream. I’ve been using this for years and it’s always been good to me. Some moisturizers make my face feel and look super oily, but this one doesn’t. To me the scent isn’t strong either & that’s always a plus when you put something on your fave that is forced to smell it. Also, it’s reasonably priced & you can find it in travel size in case you are on the go! 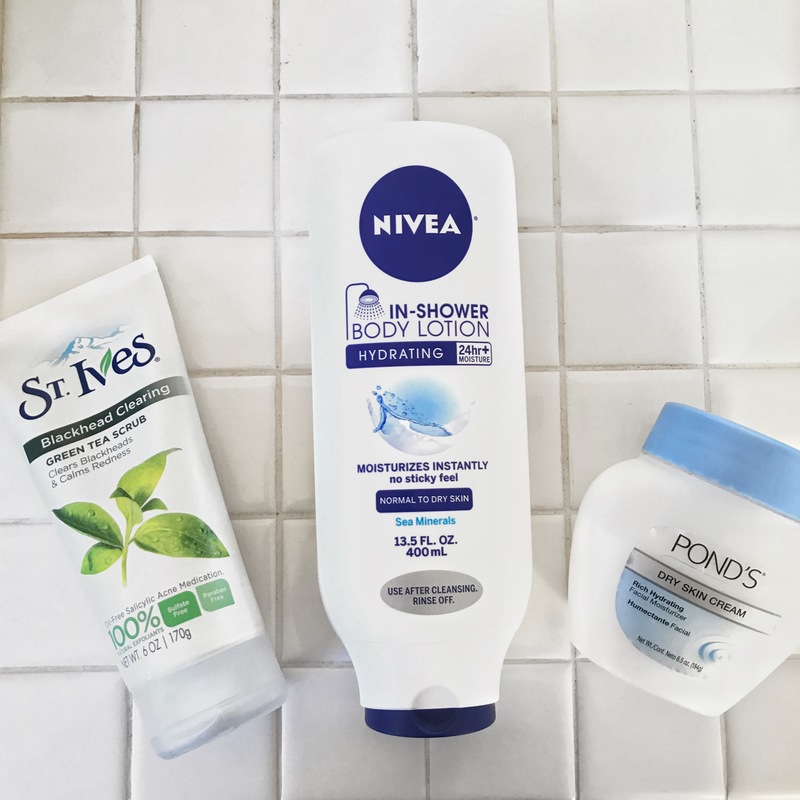 These three products are my go to when cleansing and moisturizing my body. They make me feel fresh, clean, and ready for a new day. What are your go to products to keep your skin moisturized? This entry was posted in A blog a day August 2017, Lists/Favorites, Personal and tagged beauty, blog, challenge, health, life, lifestyle, Lists, Personal, random, recommendations, recommended, writing on August 17, 2017 by Adele Fredeluces.